Tim was trying to see how thin he could make the walls of a bowl when he created this item. Lucas and I fell in love with the bowl before it was even finished. 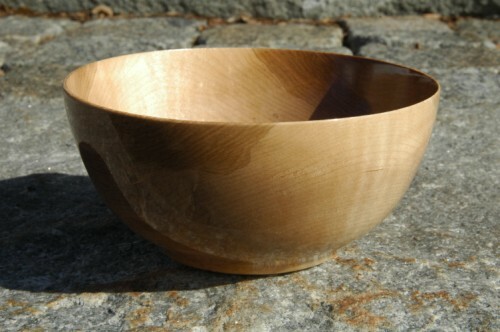 Maple is one of my favorite woods, the simple lines of this bowl and its practical size makes this my favorite bowl. We use it daily, it is the perfect size for single serving bag of microwaveable popcorn (hence the name). This bowl does not have a penny on the bottom, I have to remind Tim to sign it for us.